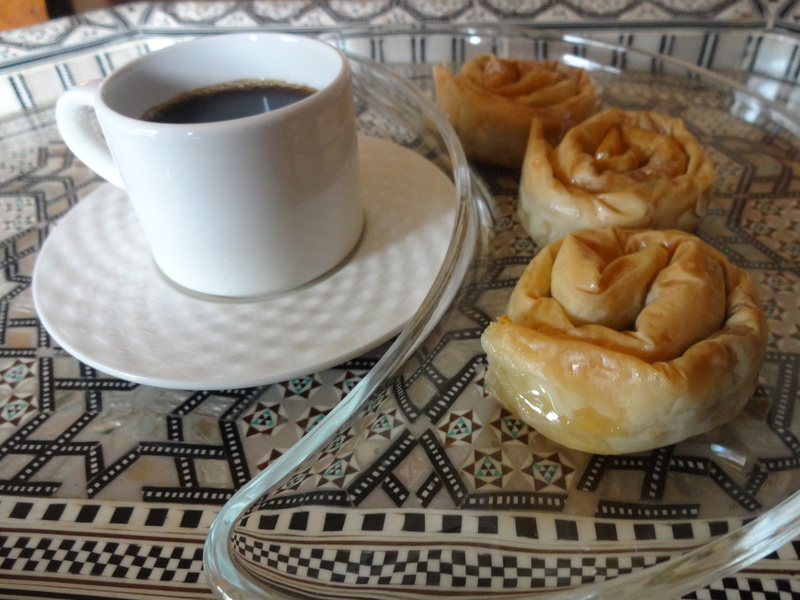 Mitabaq is Palestinian cinnamon rolls, filled with walnuts and cinnamon, and dipped in a thick qatr. 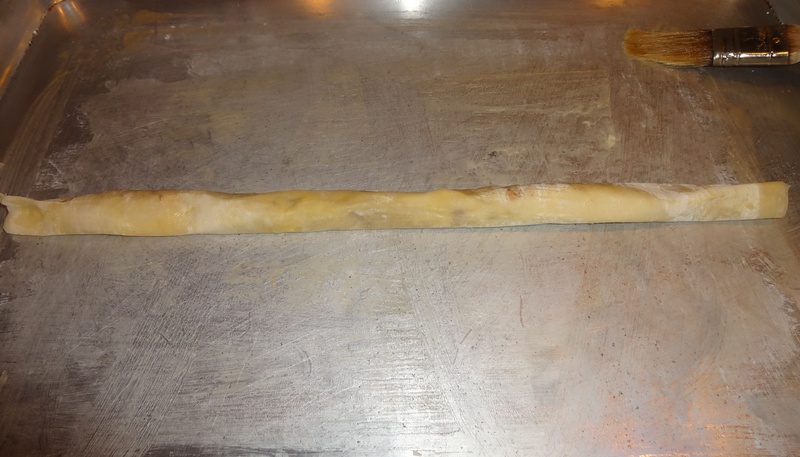 Traditionally mitabaq is made with a soft dough. 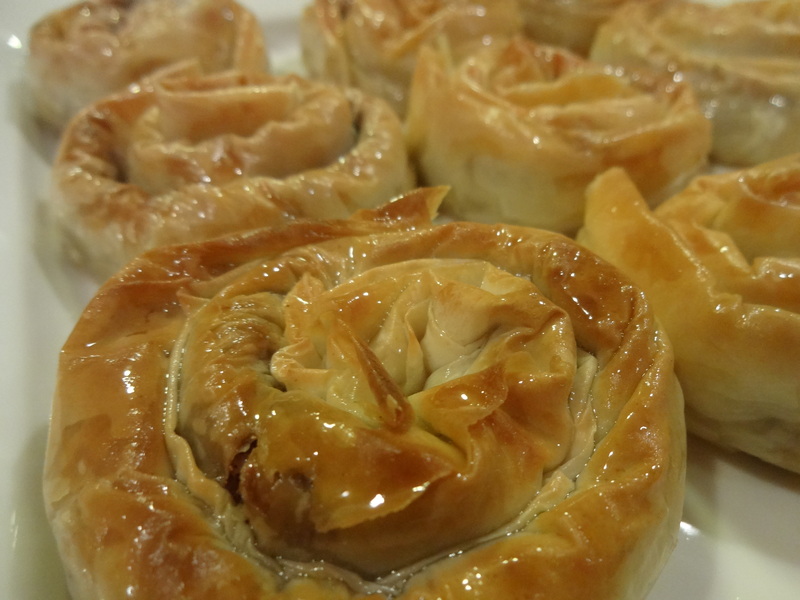 Our recipe is a crunchy Mitabaq made with Filo dough. 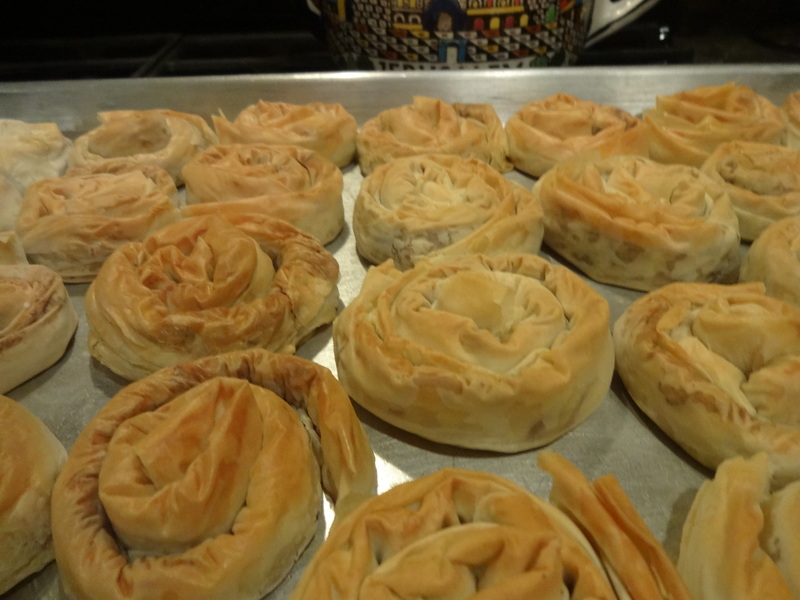 Although a lot of the desserts in Palestine are made with qatr, each one of them has a unique, defined taste. Follow the thawing instruction on the filo dough package. To prepare the qatr, add the sugar and water in a small pot, put it on the stove over medium high, and mix it well until the sugar is dissolved. Bring the mixture to boil, lower the heat, add the lemon juice and the orange blossom water. Keep it on the stove for 10-15 min to cook, turn of the heat and set it aside. To prepare the filling mix the crushed walnuts, sugar and cinnamon in a bowl. 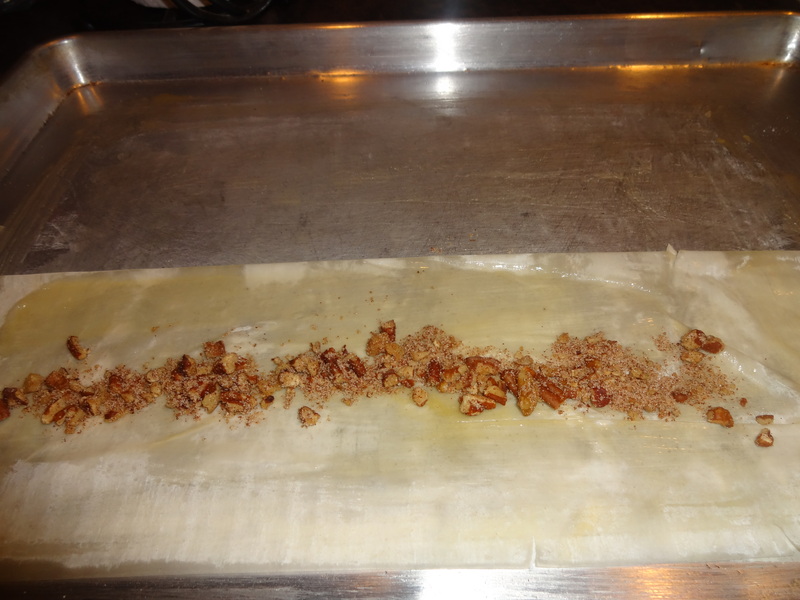 To prepare the mitabaq, take one sheet of the filo dough, brush it with the melted butter, fold the sheet in half, put a line of the filing in the middle of the sheet, fold one side of the dough sheet over the filling, then the other side, you’ll have a filled tube. 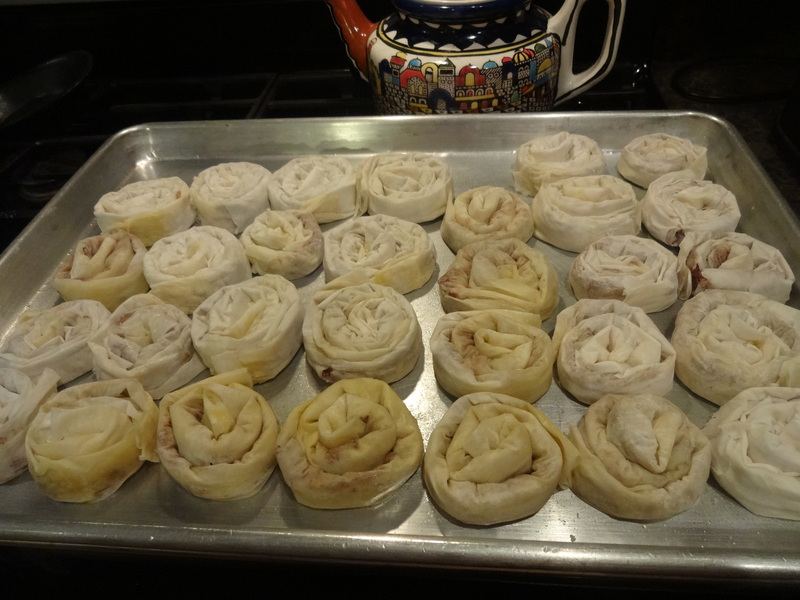 Starting from one end, roll the filled dough all the way to the other end, place the filled roll on a baking sheet, repeat these steps until you use all of the thawed filo sheets. 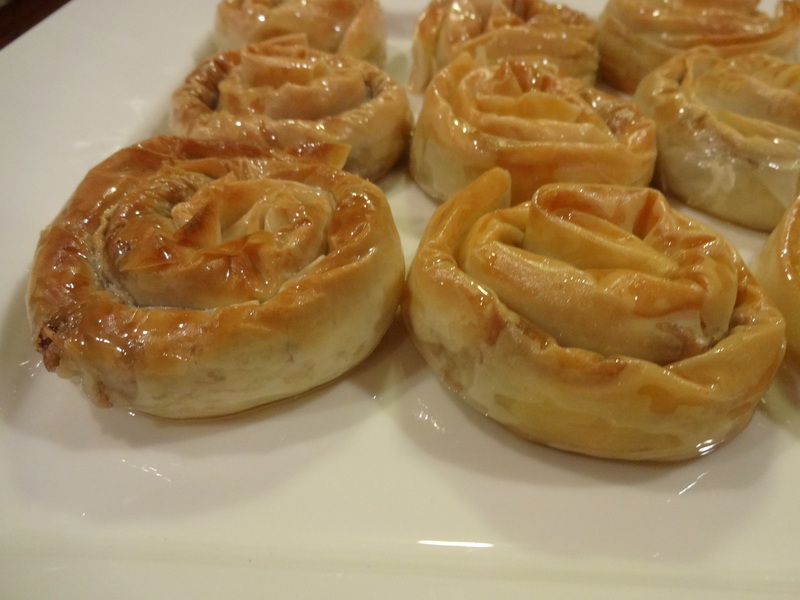 Preheat the oven to 350, place the baking sheet in the middle rack, bake for 12-15 min, turn on the broiler and broil the top part until it’s golden brown, remove from the oven and right away dip each roll in the qatr for couple of seconds, then serve.